The students are becoming more and more independent and proficient at choosing a tool and showing their learning with their iPads. As you can see by the picture below, they think it is important to get just the right angle when taking a picture of a non-digital artifact! 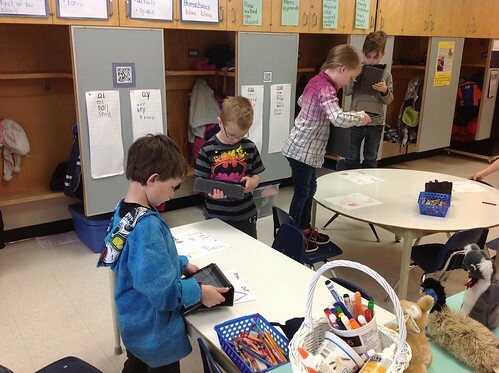 Check out the learning on their blogs about digraphs that they were taking pictures of. I love your blog and your students’ blogs are great, too. I hope I can get some teachers in my new district interested in blogging and maybe we can do a project together, too. Hi. I love the idea of your student writers reflecting on their own writing. This can be a powerful tool to teach young writers. I try to place high value on self-reflection in my sixth grade classroom. Its great to see this same thing in younger grades as well. It is pretty cool to see the students using iPads as a part of their assignment. Teachers have to keep up with the 21st and what the kids use outside of the class. This is a excellent way to keep them engaged.